Make potty training fun with these funky pants! Your little one will be proud to wear these during trips to the toilet. We love skulls as do most little boys..they will love our pirate pants! Cotton pants with elasticated waist and legs. 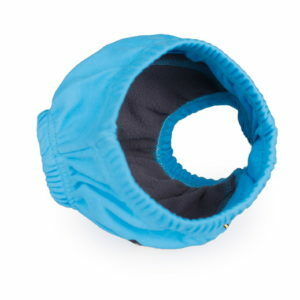 They have a 3 layer system in the gusset with a fleece lining in the gusset and below that a waterproof lining. 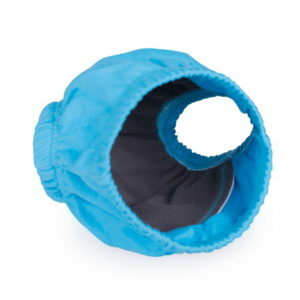 This teaches the child that they are wet but keeps the wetness inside the pants rather than causing puddles on the floor. We do say that they contain one wee but it does depend on each child. They do help not having to change full outfits, socks and shoes and all.. Each pair come with a guide to potty training the Baba+Boo way! The training pants are well presented on a recycled cardboard hanger which has lots of information on it for use. The fabric is soft and well sewn and the bamboo fleece lining is soft and lush. The training pants look like they will sit to the tummy so suitable if you or your toddler don’t like a low riding training pant. 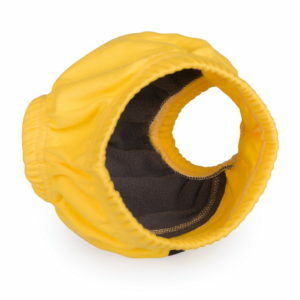 They aren’t water proof but are lined in bamboo – allowing the toddler to feel wet but helping soak up some or all of the wee so you don’t have such a massive puddle to deal with. They sit quite high on Piper but are a good fit – her thighs are quite chunky at the moment (must be where she is storing for her next growth spurt) but the elastic isn’t too tight. She seems nice and comfortable in them and wears them 3 times without a wet accident. When she doesn’t have a wee in them the bamboo is very absorbent and holds most of the wee in the training pants which is very helpful! She really likes the picture on the bum and says “rock on!” when she sees them lol. Although these cost more than the terry cotton traditional training pants you can pick up at best and less the quality is definitely there. Cheap training pants and lined with foam (literally foam – with all the fabulous absorbent materials on the market you would think they would change that by now) and generally have ribbing on the legs and sometimes tummy or underwear elastic on the tummy. These have cased elastic on legs and thighs for a better and more comfortable fit – also easier to replace if you put them to use for different children over a period of time and the elastic starts to get a little slack. The fabric is strong and won’t run like cotton terry. Also these look like undies.